Dr. Cendales recognized as "Personaje Destacado del Ano"
An Emory Transplant Center protocol published in the Proceedings of the National Academy of Sciences Early Edition shows that an experimental combination of treatments can convert immune cells that would normally recognize and attack a transplanted organ into cells that control the immune response. This could enhance the chances of avoiding rejection of the transplanted organ and may help the recipient wean off anti-rejection drugs over time, reducing the rate of long-term complications. Mice with skin grafts were used. 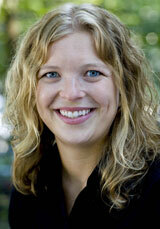 The senior author is Mandy Ford, PhD, assistant professor of surgery at the Emory Transplant Center. First author Ivana Ferrer is a student in Emory's Immunology and Molecular Pathogenesis graduate program. "We found that a subset of cells that would normally attack the graft instead turn on a gene that instructs them to become graft-protective," Dr. Ford says. "These protective cells are called regulatory T cells — they are present in everyone’s immune system and normally prevent us from developing autoimmunity. Previously we didn’t know whether the treatment was simply enhancing regulatory T cells that were already there, or whether it actually induces the emergence of a new group of graft-specific regulatory T cells." An opportunity to alter the course of an immune response exists when cells that would normally attack the transplanted organ are activated, which occurs when they come into contact with donor cells. 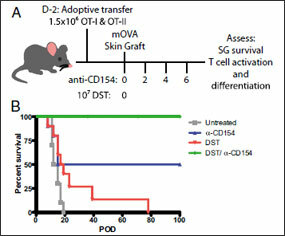 If this happens while CD154 is blocked, the cells either die or convert into regulatory T cells, the Emory team showed. One obstacle to using drugs that block CD154 clinically is that they can induce blood clots in humans. Dr. Ford says Emory researchers have been investigating alternative methods of blocking CD154 signals. The Senior Design Project course of the Wallace H. Coulter Department of Biomedical Engineering of the Georgia Institute of Technology and Emory University offers unique and stellar opportunities for educator-and-student collaboration and synergy. The program facilitates the formation of ventures involving senior undergraduate GA Tech BME student capstone project teams of four-to-eight members and qualified instructors or outside advisors to develop a medical product. By volunteering to mentor a team, any Department of Surgery faculty member with a viable concept for an innovative device can lead a team dedicated to overcoming the engineering hurdles inherent to creating any prototype, possibly resulting in a marketable product. 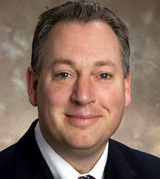 For two semesters, Dr. John Puskas, director and founder of the Cardiothoracic Surgery Clinical Research Unit, mentored an eight-member BME student team as they applied their knowledge of the phases of design research, generation of engineering alternatives, prototyping and testing, and the FDA 510(k) regulatory pathway for medical device clearance to design a prototype of a sternal retractor that Dr. Puskas had originated. 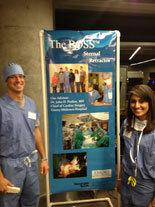 "Not only was it a learning and discovery process for all of us, it was a heck of a lot of fun," says Dr. Puskas. "They visited both the lab and the OR at EUH-Midtown at least a dozen times, discussing the concept with me and observing cardiac surgery procedures. As time progressed they became more confident and their solutions to problems became more concrete." 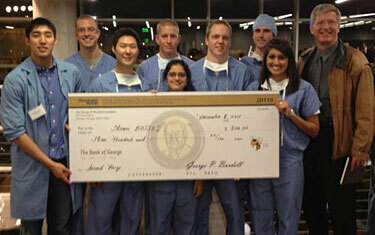 Competing against 40 other teams of GA Tech students, Dr. Puskas’ team presented their prototype at the Senior Biodesign Capstone Project Competition on December 9 and won second place, receiving a cash prize. The team consisted of Josh DeVane, Benji Hoover, Eric Kopfle, Matthew Lee, Daniel Pak, Kevin Parsons, Priya Patil, and Poornima Venkataraman. "Our next step will be to refine the retractor design through iterative changes in plastic prototypes and then to create a stainless steel prototype that can be tested clinically," says Dr. Puskas. "The BME students and GA Tech’s prototyping facilities provide that capability as well." Faculty interested in investigating this opportunity can find more details here. "Preemptive Renal Transplantation Among the Pediatric ESRD Population," presented at the American Society of Nephrology's Annual Kidney Week, concluded that pediatric racial minorities are much less likely than whites to get kidney transplants before they need dialysis, regardless of their socioeconomic status. 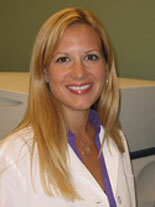 Rachel Patzer, PhD (Emory Transplant Center, Emory Department of Epidemiology), was the study PI, and her co-investigators were Sandra Amaral, MD (Children's Hospital of Philadelphia), Nancy G. Kutner, PhD (Emory Department of Rehabilitation Medicine), and William M. McClellan, MD (Emory Division of Nephrology). Because the demand for suitable organs for transplant outweighs the supply, most patients with kidney failure must start on dialysis while waiting for a transplant. Dr. Patzer and her colleagues investigated how race and poverty impact access to kidney transplantation before dialysis — called preemptive transplantation — among children with kidney failure. "Among pediatric kidney disease patients in the United States, white patients have a significantly higher rate of getting a kidney transplant without ever starting dialysis compared to blacks and Hispanics," says Dr. Patzer. "The reasons for this racial disparity are not entirely clear, but could be due to lower access to health care among minority patients." By analyzing data from the United States Renal Data System from 2000 to 2008, the researchers found that the average annual rate of preemptive transplantation was higher among whites than Hispanics and African Americans. Racial differences were also evident in the type of preemptive transplants children received, where more white patients had living donors (78.8%) vs. Hispanics (57.3%) and African Americans (48.8%). Hispanics had a 50% and African Americans a 56% lower rate of preemptive transplants than whites. Socioeconomic status, as measured by health insurance and neighborhood poverty, did not entirely explain this observed racial disparity. The same team presented a second, similar study at the conference. Led by Dr. Amaral, "Mortality and Race in Pediatric End-Stage Renal Disease: Who Is Dying before Transplant?" analyzed racial differences in deaths among children with kidney failure. The researchers examined all kidney failure patients under 21 years of age who went on dialysis between January 2000 and September 2008 and did not receive a transplant during the study, which ended in September 2009. The study found that among children with kidney failure waiting for a transplant, African Americans with no health insurance were more likely to die than whites, while Hispanics were less likely to die than other racial groups regardless of insurance status. "More studies are needed to understand why these differences occur," said Dr. Amaral. David Lefer, PhD, and thoracic surgery postdoctoral fellow Benjamin Predmore presented "The Novel Hydrogen Sulfide Donor Diallyl Trisulfide Protects Against Ischemia Reperfusion Injury by Inhibition of Mitochondrial Respiration" at the recent American Heart Association Scientific Sessions conference in Orlando. 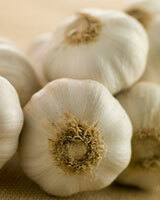 The study found that diallyl trisulfide — a potent-smelling component of garlic oil — may help release protective compounds to the heart after heart attack, during cardiac surgery, or as a treatment for heart failure. At low concentrations, hydrogen sulfide gas has been found to protect the heart from damage. However, the substance is unstable and volatile, rendering it difficult to deliver as therapy. Dr. Lefer and his team at the Cardiothoracic Surgery Research Laboratory located at Emory University Hospital Midtown have turned to diallyl trisulfide, a garlic oil component, as a way to deliver the benefits of hydrogen sulfide to the heart. Their findings suggest that doctors could use diallyl trisulfide in many of the situations where researchers have proposed using hydrogen sulfide. "We are now performing studies with orally active drugs that release hydrogen sulfide, one of which is diallyl trisulfide," says Dr. Lefer. "This could avoid the need to inject sulfide-delivery drugs outside of an emergency situation." Working with Dr. Lefer, Dr. Predmore blocked the coronary arteries of mice for 45 minutes, simulating a heart attack, and gave them diallyl sulfide just before blood flow was restored. The compound reduced the proportion of damaged heart tissue in the area at risk by 61 percent, compared with untreated animals. "Interruption of oxygen and blood flow damages mitochondria, and loss of mitochondrial integrity can lead to cell death," says Dr. Predmore. "We see that diallyl sulfide can temporarily turn down the function of mitochondria, preserving them and lowering the production of reactive oxygen species." Several days before Thanksgiving, patient Sean Dookwah was implanted with a left ventricular assist heart device at EUH, the 100th such device installed at Emory. He was released for home a few days after his surgery, just in time for the holiday. As he prepared to leave, Mr. Dookwah commented: “I feel incredible compared to where I was just a few weeks ago. I was so tired and weak I couldn’t walk from one part of the room to the other." "This is a tremendous milestone for both our program and the future of heart assist device technology in general," says David Vega, MD, director of the heart transplant program of the Emory Transplant Center. "Until recently, surgeons have been implanting VADs as a temporary bridge to heart transplantation. We now have the ability to also offer destination therapy to those patients who are either unable or unwilling to undergo a heart transplant, meaning the device will stay with the patient indefinitely." Cardiac surgeons at Emory implanted Georgia's first VAD to be used as a bridge to transplant in 1999, and began implanting VADs as a means of providing permanent destination therapy for heart failure rather than as a bridge to transplant in 2006. 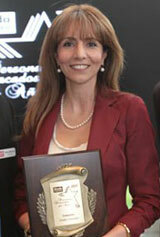 Dr. Linda Cendales was recognized as the "Personaje Destacado del Ano" (Outstanding Individual of the Year) in 2011 in the "Work" category by Mundo Hispanico, the largest Hispanic Newspaper in Georgia (affiliated with the AJC). Dr. Cendales' recognition was the only healthcare-based instance and was founded on her work as a physician and leader of the hand transplant team that performed Georgia's first hand transplant in March 2011. The Awards Ceremony was held on December 8 at Cox Enterprises. The Personaje Destacado del Ano honors figures in varying categories, trades, and professions whose passion, particular talents, and dedication to service have made significant contributions to society and have and will continue to be a source of inspiration to all Americans.